Tomorrow marks the start of perhaps the coolest annual comedy event in the country, The Del Close Marathon at the Upright Citizen's Brigade Theatre. 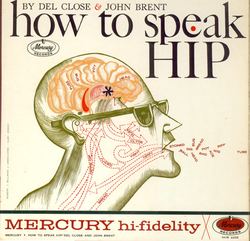 And that means this is the perfect time to share Del Close and John Brent's How To Speak Hip. Released in 1959, this album captures the underground comedians at their early best and manages to both lampoon and accurately encapsulate the difference between hip and square society at the time. Unlike other mean-spirited comedy takes on the beatnik craze (Allan Sherman's "The Rebel" springs to mind), Close and Brent's satire was close to the truth because they truly were bohemian spirits. John Brent wrote poetry and honed his "Geets Romo" character (also known as "Huey the Hipster") while acting in a Jules Feiffer play. Del Close was an actor and poetry director at the Gaslight. And they both became well-known as being early members of Chicago's Second City. Even though Del Close plays the square reporter on How To Speak Hip, he went on to live one of the most exciting (and hyperbolic) lives in comedy history. He befriended, worked with, and quite often did copious amounts of drugs with the likes of Lenny Bruce, Wavy Gravy, Frank Zappa, Tiny Tim, the Grateful Dead, and the Merry Pranksters. Then he cleaned up his nasty heroin habit in the 70s, and Del's stint as director of Second City made him even more legendary as he went on to train and inspire many of the country's greatest comedic talents (Check out the biography Guru for more on Del). Included with the "How To Speak Hip" L.P. (and one reason to seek it out), is an informative manual. Download a tasty chunk of it as a pdf file. But wait! You think this is the first guide to cool bohemian slang talk? Neigho, Pops... the hepcats were there first. Starting in 1938, Cab Calloway published continual updates to his own Hepsters Dictionary, "the official jive language reference book of the New York Public Library". Read some of the definitions on line, or learn all you need in one quick dose thanks to this informative song. Listen to: Cab Calloway, "Hepster's Dictionary"
And in other hip dictionary finds, Slim Gaillard attached his name to a promotional piece that is also hard to resist: The Slim Gaillard Vout-O-Reenee Dictionary. While not as detailed as Cab's guide, it does at least help you to decipher Gaillard's infectious scatisms. Download pdf version. Sorry, there is indeed a page missing. Del Close's first album The “Do It Yourself” Psychoanalysis Kit also from 1959 is worth a listen as well. We uploaded this artifact in December 2005, but it is still available at the first of the 2 links. Gosh. 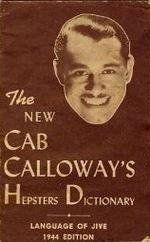 Put a pipe in Cab Calloway's mouth, and he looks eerily like "Bob" Dobbs. This is one of my all time favorite records. It's been difficult to find in its entirety,(for me anyway).The copy of this recording I've been listening to for years, had half the tracks polluted by noticeable annoying distortions. Great Post! I should mention I've been extensively "edutained" by Max Decharne's "Straight From The Fridge, Dad: a Dictionary of Hipster Slang". In the Pet Sounds Sessions CD box set, Brian Wilson mentions that he was listening to "How To Speak Hip". Thanks again for a Dinosaur Gardens link, Clinton. I would just point out that that is actually the complete Hepster's Dictionary. It wasn't very long. Absolutely brilliant. Where in the world did you find the Slim Gaillard dictionary? There's this nut eating JELL-O.. looks funny to me!!! Thank You again WFMU! Another all-time favorite that has been lost to me makes it to the land of golden mp3s.. there's an, unknown to me, next generation addendum... "How to Speak Modern" '45 out there somewhere to. Aww, baby, the "How To Speak Hip" PDF is, like, missing a page. And, like, while I got hung up on the hook, the hook as it's set won't get me past the Roach and that's like, a major bring down, you dig? Can you give some freaky person over there the gig of reposting the PDF booklet in, like, full? For further reading: there's a great dictionary of terms in the back of William S. Burroghs' "Junky". Unfortunately, that last page of How to Speak Hip is missing (I found it on line here), but if anyone out there has it scanned it I'll be happy to update the file. Oh, and the whole thing was reprinted in the CD liner notes - but you'll have to find that on your own (out of print, of course). Slim's is missing pages 14 and 15 and has 12 and 13 twice instead. Can this be corrected? I have a blog on Del and myself, and our 6 years of doing comedy, etc.